America is once again drifting toward war. Less than ten years after the U.S. invasion (and subsequent occupation) of Iraq, its myriad lessons seem forgotten. A familiar, toxic mix of sloppy politicians and politicized foreign policy experts is telling the American public that an irrational Iranian regime hell-bent on acquiring and using nuclear weapons poses an imminent threat to its safety -- despite the highest levels of America's national security establishment speaking on the record to the contrary. The ghosts of America's neoconservative past have successfully shaped the policy around its selling points despite next-to-zero discussion about the consequences of war. Obama administration officials have always been delicate when pushing back against their hawkish counterparts on Iran policy, and election-year considerations have heightened those sensitivities to the point of near-paralysis. Reductionism has focused the debate in America on how the military can stop an Iranian nuclear bomb that is neither in existence nor imminent. Many Americans who believe this dishonest discourse cannot be blamed for basing their views on the misinformation they receive. A free press that reports with neither passion nor prejudice is part of America's democratic fabric. And yet, we despair about the credulousness of the U.S. media when it comes to this dangerous saber-rattling vis-à-vis Iran. 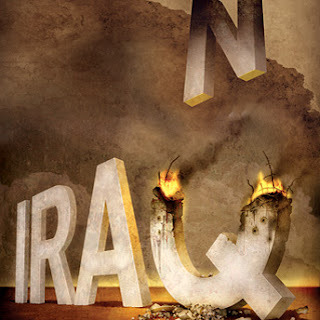 Rather than learning from sins previously committed in the run up to the Iraq war, most media outlets are sticking to the same formula on Iran. To avoid a disastrous repeat, their questions need to recalibrate the frame of the debate to put it in its proper context. Q. America has not had a diplomatic presence in Iran for three decades. As such, much of our knowledge relies on intelligence. Given the controversy over our intelligence on Iraq, how are we factoring in and addressing the uncertainty of intelligence on Iran's nuclear program? Q. What are the forces behind Iran's nuclear program? Could one factor be a desire for a nuclear deterrence due to a sense of insecurity and threat? If so, how can we affect Iran's sense of need for a nuclear deterrence? Does the increasingly bellicose and confrontational approach of the West actually increase Tehran's desire for nuclear deterrence? Looking back at America's recent wars, the American people trusted that their elected leaders accurately assessed the pros and cons of their policies. It didn't take long before protracted quagmires collapsed that trust. With the notable exception of neoconservatives, most Americans eventually realized the sad truth: their leaders didn't have a plan beyond bombing; they knew little if anything about the country in question; and they failed to conduct a realistic cost assessment -- in both blood and treasure -- of the endeavor. By the time Americans realized all of this, the damage had already been done. Avoiding another war of choice will require a media that digs beyond agenda-driven analysis and prevents the debate from being curtailed. It will require a media that doesn't permit a question of life and death to be framed in a simplistic manner that leaves the U.S. with a false choice of either bombing Iran or accepting an Iranian bomb. It is the responsibility of reporters -- not congressmen, senators, neoconservatives or foreign governments -- to not only get answers to their questions, but also to define the questions properly.